It is almost impossible to hurry Oma along. She takes her own sweet time getting to work and home again. You just have to get in that spirit if you are going to ride with her, and perhaps leave a little earlier than usual. But that is also the joy of riding with Oma, chances are she is going to want to stop along the way to take a look at something interesting, something most people stuck in cars (or even hunched over on a faster bike) might miss. I was riding over the Wells Street Bascule Bridge when I caught a glimpse of white floating in the river. I hopped off Oma, stood her up on the double kick stand along the riverwalk and managed to grab a few quick frames before this guy paddled slowly away down the Milwaukee River. 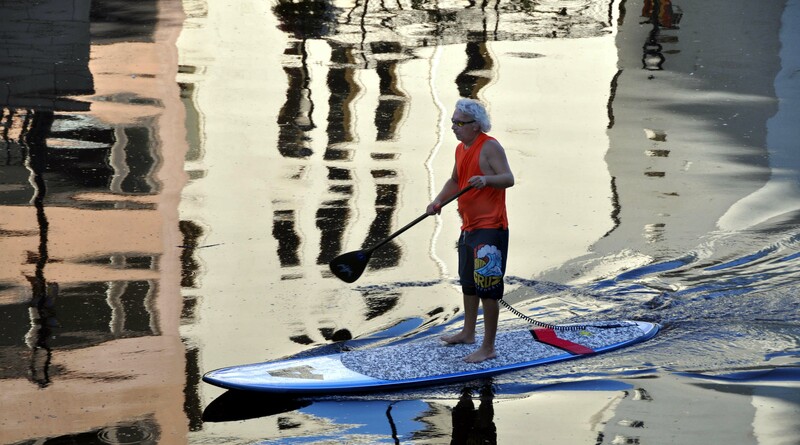 It seems he is on the Dutch version of a surfboard, upright and slow, but with a great view. Great pic, Dave! Is that Arlo Guthrie?